While we studied abroad for a semester in London, a friend and I jokingly suggested, after realizing how many we had already visited, that we ought to plan our entire life’s bucket list around seeing every World Heritage Site on the planet… and then we actually looked at the World Heritage website and realized we did not have the time to see all of the sites in the United Kingdom, let alone the world. 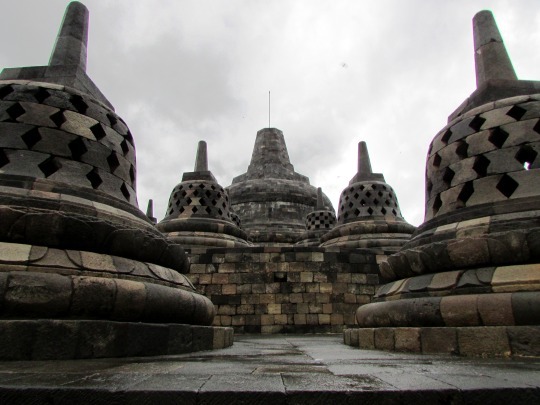 Even so, it gave me great satisfaction when a recent trip to Yogyakarta allowed me to add two more World Heritage sites to the small list of those I have been fortunate enough to visit: the Buddhist and Hindu temples Borobudur and Prambanan. predominantly Protestant and Catholic), in what was probably one of the most peaceful religious transitions in history. 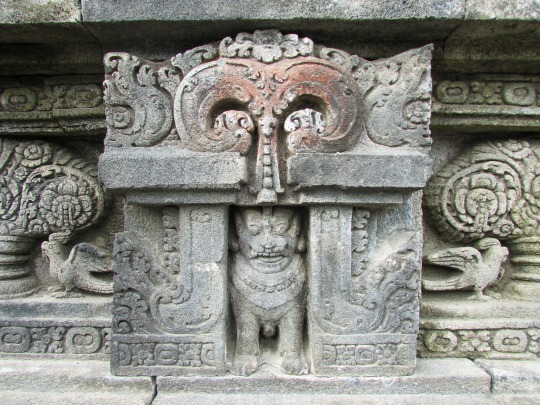 that already existed on these scattered islands, and reminders of its time as a majority Hindu and Buddhist culture still remain all over Indonesia. head around. 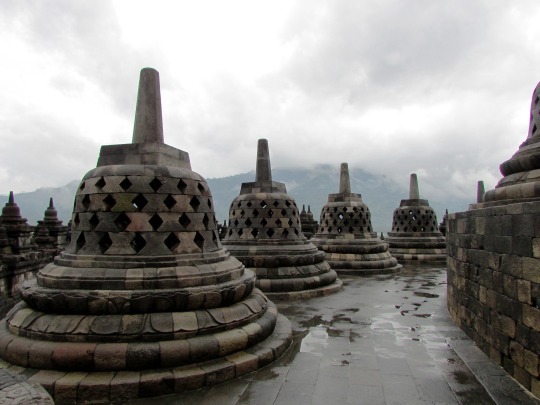 In the 14th century Borobudur sort of disappeared, known only by the locals, but in the early 1800s it was “rediscovered,” and has been one of Indonesia’s top tourist destinations, well, pretty much ever since. 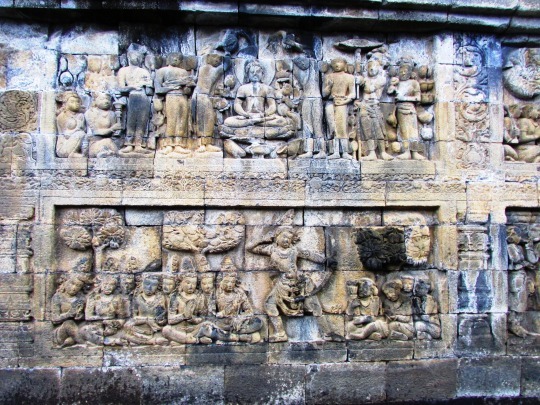 Like so many ancient structures, Borobudur seems defined by rock, carvings, and stairs. Though there is a direct route strait up to the top of the temple, it is also possible to weave your way around the entirety of the structure, following the story of a prince as he achieves Nirvana on over 2,500 relief panels that decorate the interior walls of the temple. Acid rain and the general wear and tear that comes from being centuries old has damaged many of these incredible detailed panels, but somehow their impressiveness endures. 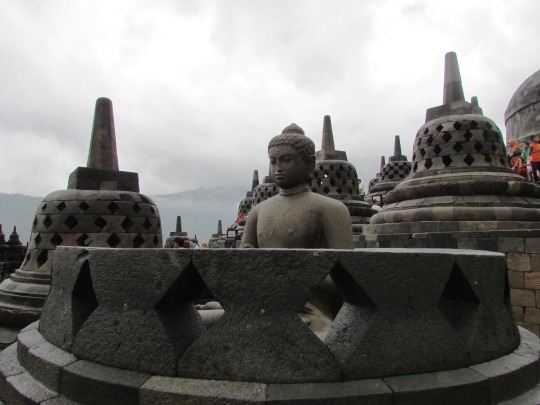 Perhaps the most memorable part of Borobudur is the over 500 Buddha statues which seem to cover every available surface. One of these Buddha statues is supposedly lucky, though I was unable to figure out which one would bring me good fortune. The seventy-two statues at the top of the temple sit within perforated bell-shaped structures called stupa, and they create a magical atmosphere that is only accentuated by the misty rain that accompanied my climb. Buddhism is one of the major world religions that regrettably I know the least about, as the one religion course I was able to cram into my over-stuffed undergraduate schedule focused on the monotheistic religions of the world. Borobudur is a sacred place of which I cannot fully understand the religious significance, but by which I am completely capable of being impressed. I feel blessed by whatever gods inspired its creation to have been able to ascend this amazing and magical piece of history. I was also able to explore a second well-known temple during my time in Yogyakarta. 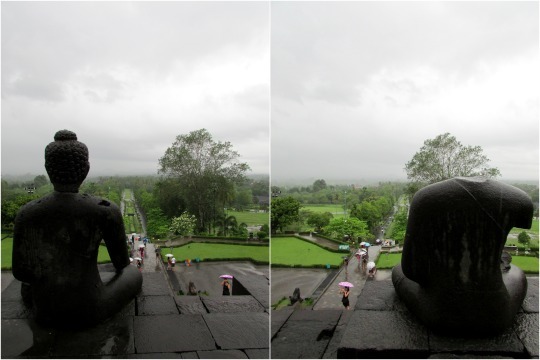 A short train ride from Yogya sits Candi Prambanan. Prambanan is not the largest Hindu site in the world, but it is the largest in Indonesia, believed to have been built in the 8th century. 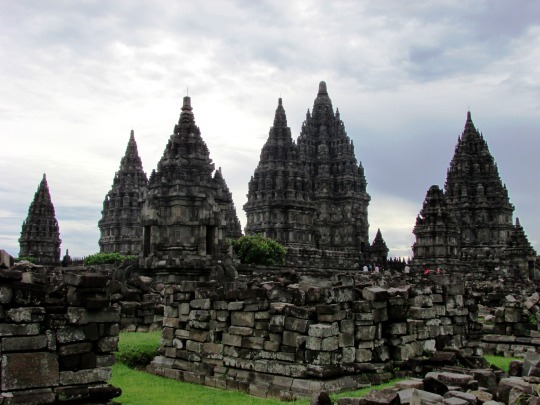 It was essentially abandoned by the dawn of the 10th century, and an earthquake in the 16th century destroyed Prambanan almost in its entirety. Like its Buddhist cousin, Borobudur, it gained attention in the 1800s, but reconstruction did not truly begin until the early 1900s. Currently, much of the temple remains in haphazard piles of stones, awaiting the funds and energy needed to rebuild this incredible site. What has been rebuilt, however, is absolutely gorgeous, and it only is made more incredible by the ruins surrounding it. Perhaps it is because I always fall in love with a work-in process—unfinished paintings, the outline of a poem—but I found Prambanan to be so much more incredible that Borobudur, even if it was physically less impressive. But that is just my personal preference. 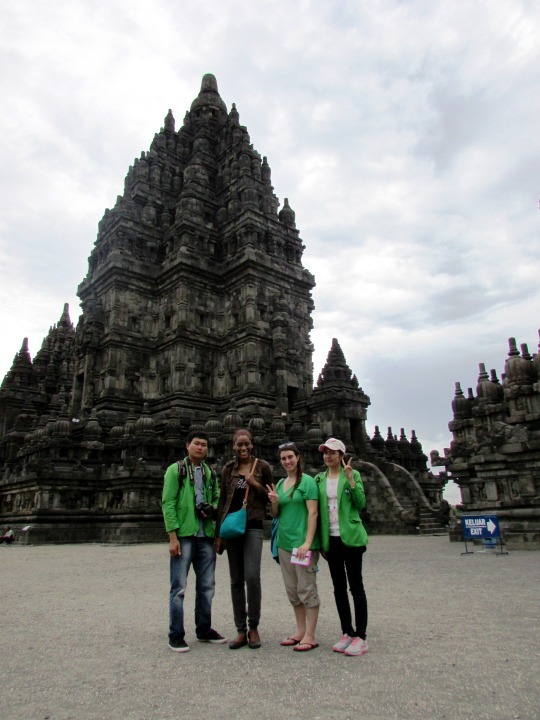 There are six main temples in the center portion of Prambanan, all of which have been rebuilt. 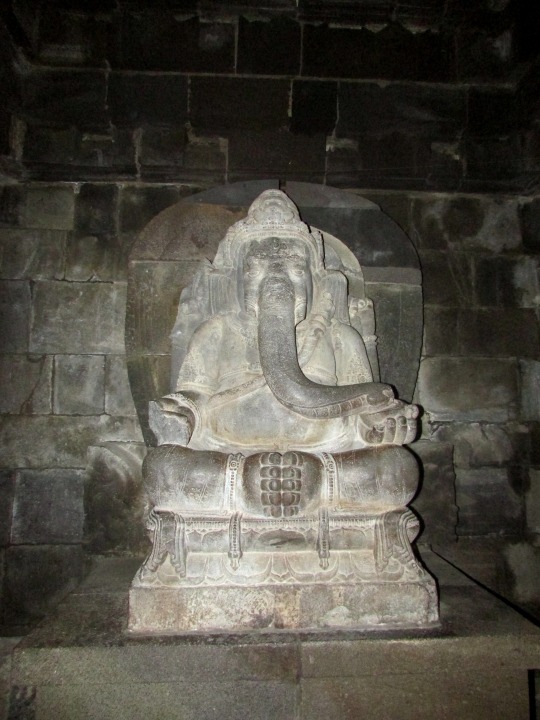 The three largest are dedicated to Shiva, Vishnu, and Brahma. Huge statues of these gods are in the center of each temple, and statues of lesser gods are tucked into smaller rooms around the edges. The three slightly smaller temples which sit across from these three are for the vahana (a kind of messenger, from my understanding) for each of these main gods: Nandi for Shiva, Garuda for Vishnu, and Hamza for Brahma. Of the three vahana, only Nandi remains: the statues for Garuda and Hamza were never found amongst the ruins. they asked us to write our commentary after the fact, I gave the warmest review I’ve ever written, and it was completely deserved. blissful inconsequence is precisely what I needed. I do not boast to be an historian, and so while I do feel somewhat guilty that I cannot seem to track down the name of said book—because I remember it as being excellent and everyone should read it—I’m going to forego any kind of citation and hope you’ll go off and do some of your own research and not rely entirely on me.